Sooz has been entertaining the masses for over 40 years! Sooz excels in not only ATS but acting, singing, emceeing, musical directing, choreography and being a professional musician. She has toured the US and Canada teaching and performing ATS since 2004. 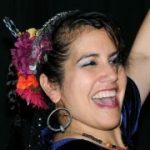 She is a proud FatChanceBellyDance Sister Studio since 2008. She has been a professional musician for most of her life excelling in piano, opera as well as musical theatre. Sooz loves to encourage and inspire performers to new heights and to be fearless, on and offstage.